Are you ready to relax and enjoy? Chill Inn Paraty Property & Pousada offers free pickup and breakfast, free internet access, free WiFi and amazing views from all Private rooms. Looking for a great place to unwind? Grab a hammock at Chill Inn Hostel. 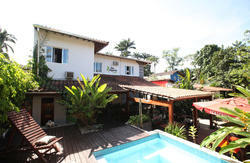 Beach-front Hostel, right in the center of town, with a cool atmosphere and dorms from R$29. Exclusive Beach Bar in front of the Hostel, we serve Breakfast, we organize Parties, Barbecues and meals every Night! Paraty is a Colonial Paradise! Come visit us! Breakfast on the beach and free pick-up from the bus station are included. 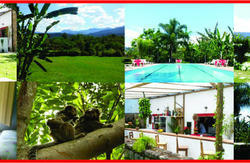 In the right moment that you set foot on Paraty, you will start relaxing and enjoying, that's our goal! Chill Inn Paraty Property has a unique beachfront location and it is also right in town, just five minutes away from the Historic Centre. We offer all rooms with en-suite bathrooms and air conditioning. We have women only dorms as well as private rooms, with A/C, Fridge and Cable TV. 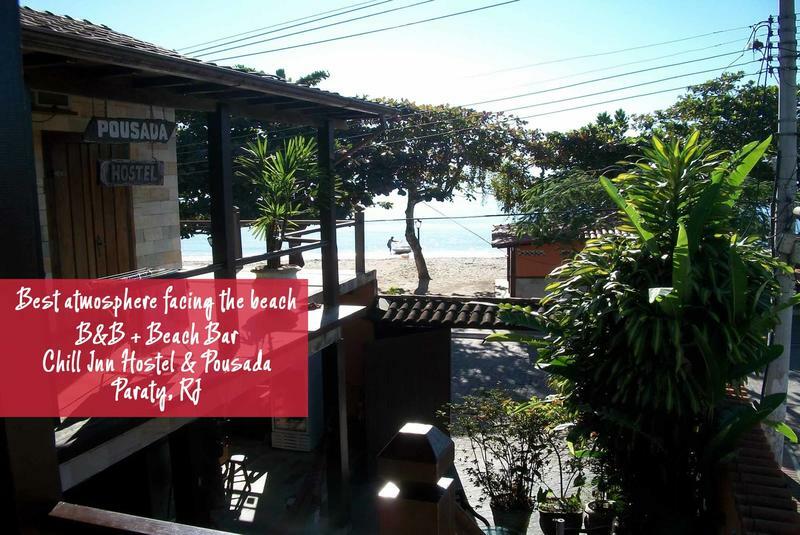 Chill Inn has a great beach bar making this Property Paraty's best Beach & Breakfast! Our beach bar is open all day providing a lovely breakfast on the beach so that you can start you day sipping a cup of strong coffee with you feet on the sand. There are also daily lunches, dinners and barbecues. Our beers are always icy cold and our barmen make the best caipirinhas on Pontal beach! - Free Breakfast: Coffee, tea and milk / Fresh fruit juices / Selection of cereals / Bread / Ham & Cheese / Flan / Home-made cakes / Fresh fruits / Butter, jam and caramel milk. - Common areas: Reading lounge / TV Room / Bar / Roaster. - Reception Languages: Italian / English / French / Spanish. Grab a hammock at Chill Inn Property and come hang with other backpackers just like you looking to enjoy all Paraty has to offer (on top of hammocks!). We offer special Accommodation Packages and Exclusive Excursions and Tours for our guests! Make us your new beachfront home while you are here, feel the breeze and smell the ocean air as you chill out with us. Chill Inn Property & Pousada offers you all the comforts of home and makes sure that you are well taken care of: clean house, good food, heaps of activities and overall enjoyment. We look forward to having you over! 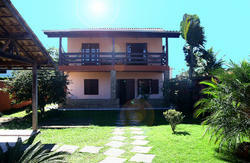 Chill Inn Property & Pousada offers promotional packages for events, bank holidays, groups and family at budget prices. The Paraty tourist packages include accommodation, lunch, excursions and transfers to the door of the Chill Inn Property if you are coming from Rio or Sao Paulo. Chill Inn Property also has Carnival, New Year's Eve and FLIP packages. Werther you are Backpacker looking for adventures in Paraty, a Couple looking for Romance, a Group or a Family, Misti Chill Property will make you feel like at home. Chill Inn Paraty Property is ideally located, on Pontal Beach facing the sea and 200 metres from the historic centre of Paraty. - WALKING: Past the Historic Centre towards the Sea, cross the Pedestrians Bridge over the Canal. Walk towards the beach and we are there! Right in front of the Beach! - DRIVING: After the roundabout going into town, turn left after the arch, drive straight 300 meters, past the Bridge over the canal and turn right all the way to the end, drive around the Plaza until you get to the Beach, turn left by the beach and you will find us 100 metres after. Chill Inn is the building in the corner. If you ask for directions say 'Praia do Pontal'. - ON A TAXI: Taxis in Paraty charge a flat rate of R$20 for any ride regardless of the distance, from 8AM to 10PM. - But remember we offer a free transfer from the Bus Station.